As modern life is getting more comfortable and urbanized, and as men are becoming less masculine than ever before in human history, fewer people are involved in the tradition of hunting, which served to curtail the excesses of various animal populations for centuries. Not to mention the effective removal of deer’s natural predators – wolves and bears. Furthermore, the ever-increasing inappropriate intrusion of government into our lives means increased hunting regulations, which further exacerbates the problem. As a result of all these factors, the deer population in the US alone has risen to astonishing 30 million. This over-population translates to dangerous increase of car accidents involving deer. One of the largest insurance corporations – State Farm – estimated that over one million Americans will encounter deer in a collision type scenario every year, ranging from fatal to property damage. And this trend is not abating, but on the contrary – deer accidents are increasing annually. Approximately 150-200 people die from deer collisions every year, and more than 30,000 suffer various injuries. 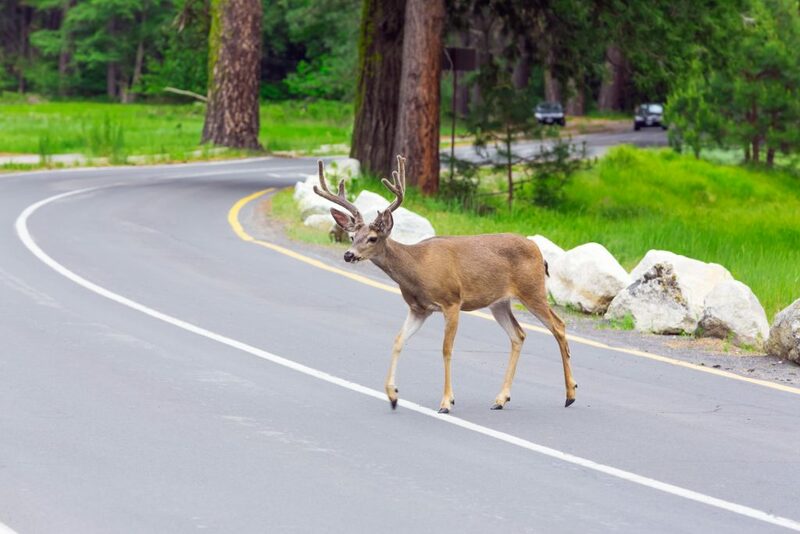 Deer will most likely die from these collisions outright, but impacts with such heavy animals at even moderate speeds can also result in chain collisions with other vehicles, careening, or slamming into a tree. If you manage to just get away with damage to your car you should consider yourself very lucky. The average damage from deer collisions settles at around $3000, which means that if you have an older car, such collision will render it completely worthless. Unfortunately, there is not one miracle solution that would prevent deer collisions. However, there are some measures you can take in order to significantly reduce the chance for these types of accidents from occurring. Be aware of your geographical area. If your state is riddled with woods and forests, the appropriate agencies have already peppered the roads with prominent deer warning signs. But you should be aware that statistics show the probability of deer collisions doubles from October to December. This is quite a drastic shift, so those are the months to employ outmost care and alertness when you drive through these areas. In addition to the season from October to December, during the day, deer activity is highest from dusk to dawn. Furthermore, seeing deer signs all year long will habituate you to them, so take a conscious effort to take them seriously – always lower your speed, always wear seatbelts, and make sure your lights are working properly, especially the high beams. If the worst case scenario comes to fruition, don’t swerve your car in order to try to avoid the collision with a deer, or any other animal for that matter. You might lose control of the car, crash into another vehicle, or start a rollover. All other scenarios are worse than a direct collision with a deer, so all you should do in that case is hitting the brakes while remaining in your own lane. Deer are skittish creatures but have become so used to the background noise of cars that they no longer perceive them as something unusual or a threat to run away from. So, deploying different sound forms might be beneficial in startling them or warning them of the impending danger. Unfortunately, the data on deer horn repellents is not as conclusive as we would like it to be. Even the ultrasound variants might not work properly because of the curvature of the road, or because ultrasound is easily blocked and dispersed by any road obstacle. With that being said, deer horns are so cheap and easy to install on your car that it is an easy decision to make the purchase. Take advantage of the latest car technologies. If you know you will be living in the area with high deer traffic, it might be wise to consider purchasing a car with extra safety measures, such as automatic brakes and collision avoidance systems. These smart computerized systems with multiple sensors can react quicker than any human, can warn you before impeding collision, match speed with the lead vehicle, and even automatically tighten your seatbelt when needed. In fact, they have such a proven record of drastically reducing car accidents that buying such a car will also reduce your insurance premium. Of course, these cars may be pricier, but nothing stops you from acquiring a used one with the automatic breaking feature. If you opt to buy such a car, make sure to first check out its rating among the most reliable cars with crash-avoidance systems. Whether you buy a car with advanced safety features, or settle for the one you already own, there is something you should add to it no matter what. If something costs less than $10, and has the potential to save your life, you really should have no compunction in buying it. Save-A-Deer whistle is an unobtrusive, tiny device that can be easily attached to any car. It relies on the flow of air to produce a distinct sound designed to alarm the animals in near vicinity. Any speed over 35 mph will be sufficient to produce this sound in a consistent manner. Although the data on the effectiveness of such devices is still inconclusive, you lose nothing by attaching it to your car, as it doesn’t produce noise that a human ear can detect.